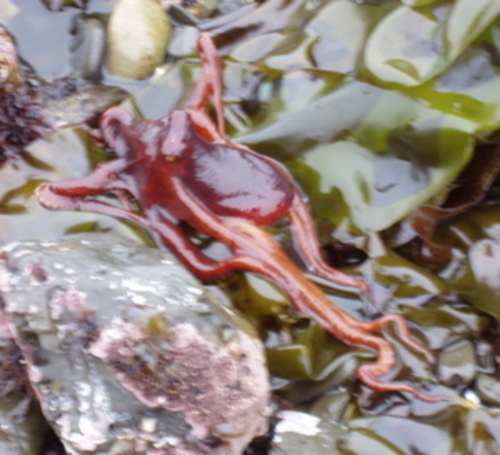 The Red Octopus (Octopus rubescens) can be found on the Southern Oregon Coast, but only at an extremely low-tide, in large tide pools or surf grass, and you have to be really lucky! 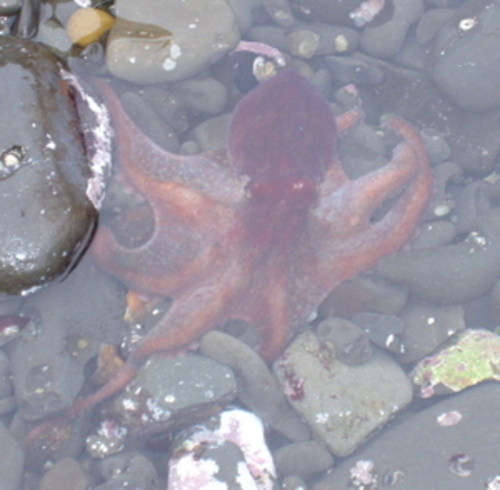 We have yet to spot our first octopus on the Oregon coast, but we are always on the look-out. 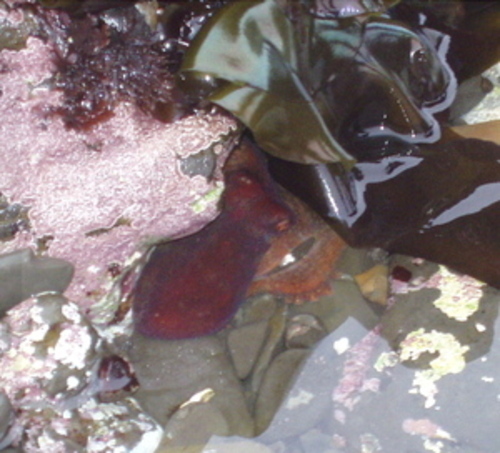 Back in April 2004 at the Fitzgerald Marine Reserve south of San Francisco, we had the tide-pool experience of a lifetime when we saw an octopus put on what looked like choreographed performance. 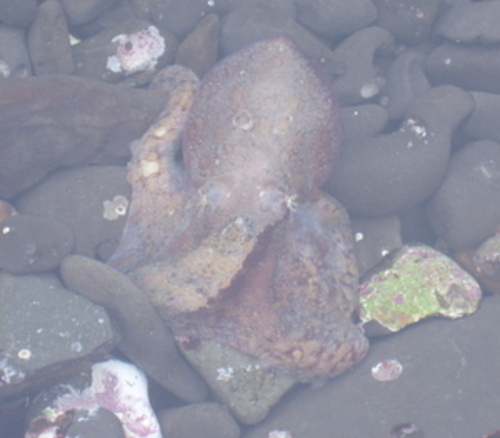 At first we saw only a couple of tentacles creep out from under a rock. 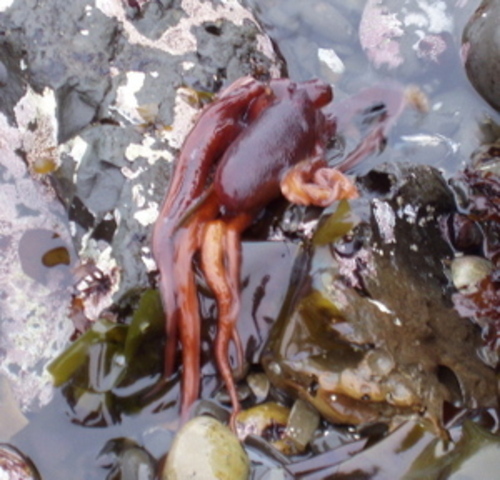 When he sensed we were near, he retracted his tentacles and his body became more bulb shaped. 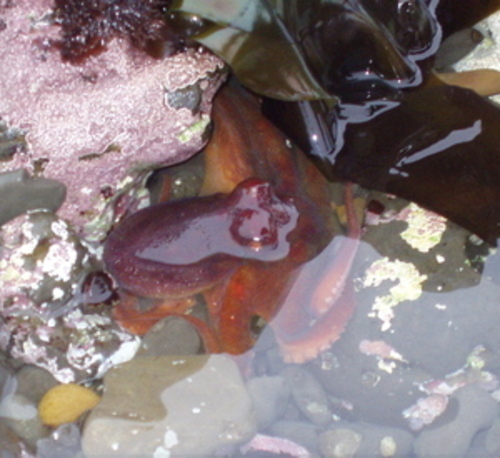 He was caught in a small tide-pool, and seemed desperate to flee our prying eyes. He poked his head out of the water and looked around for a means of escape. In just a few seconds, we watched him begin to change color. He also seemed to change texture to more closely blend with his surroundings. 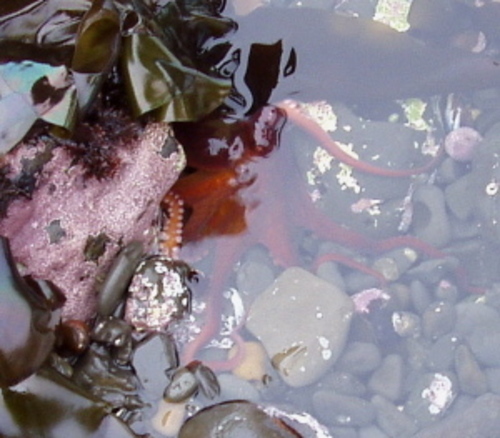 At this point, he lunged out of the water and "slip-slided" across the kelp-covered rocks. This is the last photo we took of him before he plunged into a surge channel and out of sight. The entire performance lasted less than four minutes!